March 25, 2014 March 26, 2014 k3fitLeave a Comment on Wacky WeDnESDay: PB2! Did you check out the recipe from Saturday for the banana hazelnut cacao bites? They are so easy to make and such an amazing guilt free treat. One of the crucial ingredients is PB2. 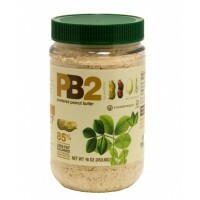 PB2 is a powdered peanut butter that rocks my world! This stuff is so easy to work with and mixes up great in shakes,desserts,dips, oatmeal mixes etc. What is so amazing about it is how much less fat it contains per serving than regular nut butters do. It has very minimal ingredients with tons of flavor. It comes in regular or chocolate….you will have a tough time deciding which one is better! Give it a try today, you can now find PB2 at any health food store as well as most grocery stores. Check out the bell plantation website to learn more about PB2, get some great recipe ideas and nutrition info. I mix it into my protein pudding every night before bed, it makes for such an excellent treat! Next Let’s Get Moving is the Correct Answer!